What did your parents teach you about money? My mom taught me how to add in my head so I could comparison shop at the store and get the best bargain, how to stretch food to feed a family, and how to set up a budget as well as how to balance a checkbook. These are basic financial lessons, and I am glad that I learned them; many of my peers did not. However, there was a lot my mom couldn’t teach me, such as how to save for retirement, because she felt that she would never make enough money to save adequately. She did not begin saving for her retirement until her early forties. My son is only seven, but I hope to teach him quite a bit about finances, specifically, those things I never learned. Teach him to save for retirement early. When my son is a teenager and gets a job, I plan to teach him about retirement and the power of compounding interest. I plan to open a Roth IRA for him and put some of his earnings there. If we have the money, I may match his retirement savings, up to his $5,000 yearly contribution, assuming he made that much in a year. Teach him to save for what he wants. This lesson has already begun, and in just a year he has become much better at it. Right now his favorite hobby is reading books. He just went to a book fair that he has been saving for the last few months. He knew I would give him five dollars, but he needed to come up with the rest; he saved $15 on his own. Teach him to work for what he wants. We bought a Dave Ramsey Financial Peace Junior set for my son, and we have been working through the material. Before the set, my son was notorious for whining and begging for money. Since he has been listening to the CD set, he has now started to ask for extra chores he can do around the house to raise money. Just this change makes buying the Financial Peace kit worthwhile! Teach him to look for a less expensive alternative. As I mentioned, my son loves to spend his money on books. I am hoping to eventually teach him about less expensive alternatives such as Paperback Swap and using the library. He does use the library extensively, but right now he wants to own the books he loves the best. Still, there are plenty of ways to own books without paying the full price. I want to show him how much further he can stretch his money with smart purchases. As parents, we often do the best we can. My mom educated me about finances in the way that she knew best. I am grateful for that because I still use some of the frugal strategies she taught me. I hope to teach my son about the benefits of saving and retirement at a young age so he can make smart financial decisions throughout his life, which is the best path to financial security. Melissa has written 5 awesome articles. I need to find something for my little sister (age 13) to read or listen to about finances. She goes overboard spending her hard earned money and won’t have anything left for college in a few years. That is the way I was when I was young. I hope teaching my son about money early will help. You might want to check Dave Ramsey’s site. I think he offers something for teens. I taught my children to save atleast 50% of whatever they earned as a child. I involved them in everything I did. I showed them how to invest and more importantly they saw I handled my money. Being a role model for your children is is very important. That is an excellent example. I bet your kids are good with money now in adulthood. Great post! Dave Ramsey’s material is all very good. I am glad to see that you invested in your son and giving him the opportunity to start learning at such a young age. I love to watch the kids strategically plan out in their little minds how to earn and save as much as possible. Even a couple quarters seems like a whole lot to them. Kudos to you and your son! Watching them budget their money is fun. My son recently earned $10 for a book fair by doing quite a bit of cleaning around the house (in addition to his regular chores). I was so proud to see what he bought and the fact that he made it a point to not spend all of the $10. Is that your son? OMG… What a cutie. You forgot to mention teach him to take care of mom in EVERY WAY POSSIBLE when she’s too old to do so. That isn’t my son, but he might have looked something like that when he was little. Very important stuff here. I wasn’t really taught a lot as a child, but maybe that was the problem. We were a frugal household and part of me thinks my 20s spending issues were a form of rebellion. Yes, it is important not to be too frugal or strict with money. That is a hard balance to achieve. Sounds like some great lessons to teach your son. And you are already well on your way to instilling those lessons in his lifestyle. Way to go! What an inspiration. Great post, Melissa! My parents matched whatever I put into my retirement fund and I’ve been saving ever since! Your son is lucky to have you to teach him to manage his money so early on in his life. Good Job! 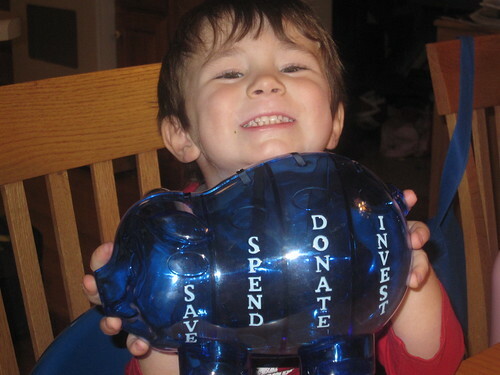 It’s never too early to start teaching our children to save. It starts with saving for what they want, to saving for college, to saving for reitrement. Once you’re in the habit of saving it’s easy. They’ll never miss the money.